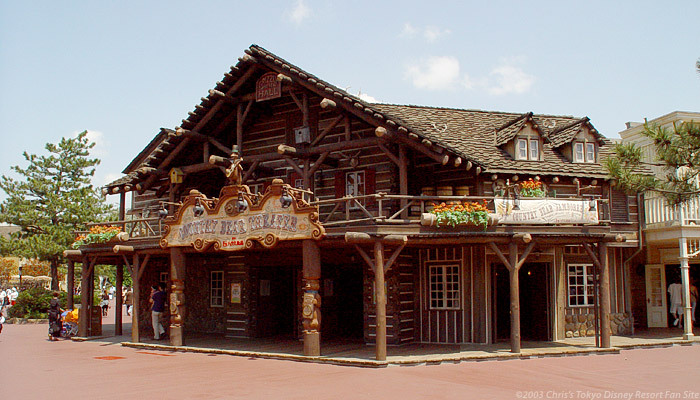 The Country Bear Theater presents a Western-style musical review. Unlike most theater productions however, the cast of this show consists almost entirely of bears. These are not your average bears, these are Audio-Animatronic Disney bears, and they sing, play a variety of musical instruments, and because this is Tokyo Disneyland they also speak both Japanese and English. The show features a range of talented players, and each has its own distinguishing personality. Henry (pronounced something like "hen-du-lee" in Japanese) is the host. Popular acts include Trixie (pronounced "tu-ree-ku-she"), Wendell (pronounced "Wen-du-lu"), and "Swingin'" Teddi Barra (which sounds pretty much the same in English and Japanese). 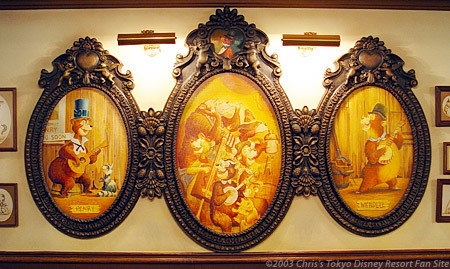 Disneyland in America had a Country Bear Theater for many years (now sadly closed); Tokyo Disneyland's version is very similar. The main difference is that almost all of the dialog is in Japanese, although some of the songs are sung in their original English lyrics. There are three different show variations that play here, and which one you see depends on the time of year you visit. From January to the end of June you'll see the "Country Bear Jamboree," the original show that started it all. From July to November plays the "Vacation Jamboree," where the Bears embark on their quest for summertime fun. Finally in November is the "Jingle Bell Jamboree," and as you might guess the show is Christmas themed. My favorite of the three is the original, but I do think it's nice that they mix it up and present the variety of shows. The waiting area for this attraction is indoors making this a safe place to visit when it's raining or very hot (or both). There's almost never a line, although you will have to wait for the next show to start. The waiting area is filled with lots of interesting things to look at, all following the theme of the show. The show is about 15 minutes long, and very enjoyable for all ages. An added bonus is that if you're a bit weary from walking around all day the Country Bear Theater lets you sit down and relax in climate-controlled comfort while you take in the entertainment. Don't forget to clap your hands and stomp your feet!